I’ve come across quite a few people who are understandably afraid of what’s happening with the situation at the Fukushima Nuclear Power Plant after the earthquake in Japan. The situation is not helped by the media reporting without context to a public that does not understand how nuclear power works. This post is an attempt to break down what’s going on and mitigate some of those fears. First, we need to understand how the Fukushima reactors work. They are Boiling Water Reactors (BWR), which use pure water to move heat from the core to electrical generating turbines. The core is built around multiple fuel bundles. At its most basic, the fuel bundle is constructed of multiple fuel rods. A fuel rod is a metal tube filled with the nuclear fuel which is usually uranium. The fuel bundles are loaded with an assortment of other components into the Reactor Pressure Vessel (RPV), which is essentially a metal can filled with water. The RPV is enclosed in a concrete pit and a concrete and metal containment building, commonly referred to as the Reactor Building. The components inside the RPV can be considered “the core”. Power generation gets a little more technical and depends on the physics of nuclear fission. Basically, a neutron passes into the fuel and causes a fuel atom to split. When it splits, heat is generated along with more neutrons. The water in the RPV serves two purposes: 1) It removes the heat from the fuel and, 2) slows down some of the neutrons to limit the reaction rate. In a BWR, the water is allowed to boil, and the steam is collected at the top of the RPV. The steam goes through a drying process, and then goes to an adjacent building with a turbine. The steam spins the turbine to generate electricity, and then is collected and cooled. The cooling process turns the steam back into water, which is then injected back into the core. The whole thing is considered to be a “plant”. 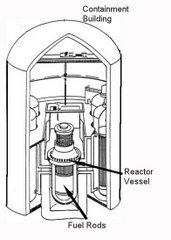 In this diagram, the reactor is on the left side. In a BWR, it is imperative to keep the core covered. Without water to cool it, the reactions will continue and heat will build until the metal covering the fuel rod begins to melt and/or break. This fuel element failure is the beginnings of what is known as a “meltdown”. When the earthquake occurred, the reactors all attempted an emergency shutdown by rapidly inserting control rods to stop all neutron reactions. This procedure is known as a “scram”. This procedure worked as advertised. Without reactor power, the plant will shift to using offsite electrical power from the grid to keep certain pumps running to cool down the core. When power generation stops, the core doesn’t just become cool. Think of it like boiling water for tea: After you remove the pot from heat, it still is hot for some time and continues to steam. That continued steaming removes water from the core. Unfortunately, the resulting tsunami swept away all of the power lines, so the plants shifted over to on-site diesel-powered generator units, just as expected. What wasn’t expected was diesel fuel damage from the tsunami, which resulted in diesel generator shutdown after about an hour. Other methods were used to cool the core and pumps from the Reactor Core Isolation Cooling (RCIC) system were used. The valves were able to operate until the batteries expired after eight hours. At this point, the plant was in complete blackout with no electrical power at all. As the core continued to cool, the water inventory continued to shrink and fuel elements were exposed. Portable diesel generators were delivered to the site and power was restored, allowing the operators to start putting cooling water into the RPV. Pressure was also rising in the containment, so gasses were vented to lower the pressure. The gasses come from the reactor, so they are contaminated with radioactive material, however the radiation was reported to be within safe limits. One other problem was the interaction between heated water and the metal around the fuel rods. As natural oxidation (very, very simply, think rusting or corrosion) occurs, one by-product is hydrogen gas. Normally, it is managed, but during the accident, it had to be vented into the containment building. This hydrogen accumulated and eventually exploded, causing damage to the containment building, however the RPV was reported to be intact. To continue the cooling process, operators decided to inject seawater into the RPV, which is a backup system designed into the plant but essentially ruins the core. This situation is the same for the #1 and #3 plants. The #2 plant is similar up to the hydrogen explosion as of this post. Plants #4, #5, and #6 were offline for inspection at the time of the incident. The emergency still continues, but even if a complete meltdown occurs, will the world suffer? Possibly, but I don’t think so. Let’s not detract from the seriousness: Any meltdown is a bad event. It requires replacement of the core, RPV, and/or associated reactor components, and is one of the worst things that can happen to a nuclear reactor. The term meltdown, which is not officially defined by either the International Atomic Energy Agency (IAEA) or the U.S. Nuclear Regulatory Commission (NRC), tends to elicit a great degree of fear because of Chernobyl, Three Mile Island, and pop culture events like The China Syndrome. A “China Syndrome” event, where the core gets so hot that it melts through the RPV, containment, and into the earth is highly unlikely. Also unlikely, I believe, is a major release of fuel/fission products to the environment. Let’s remember that the RPVs are all currently intact, and unless they are damaged by an aftershock or a large explosion, any released fission products will remain in the vessel. That also means that there will be no fallout to spread on the trade winds around the world. Fission product release at Three Mile Island was a result of operator error. The Chernobyl disaster occurred during the scram to shut down the core, and it resulted in destruction of the RPV and the Reactor Building in an explosion that spread contamination around the world and left the area in Ukraine uninhabitable. Neither is applicable here. Japanese officials are distributing potassium iodine to the local populace in order to prevent thyroid poisoning by radioactive iodine from the fuel elements. There’s also a claim that the released hydrogen will cause acid rain. No, it won’t. I’ll leave that one to the chemists and meteorologists. The worst case scenario without a breach of the RPV is that the fuel completely melts down and they have to replace the three RPVs as a result. There may be some limited gaseous release — hence, the potassium iodine — but likely nothing more. There are already rumblings that we should put nuclear advances in the United States on hold as a result of this emergency event. I disagree wholeheartedly. Nuclear power plants have been operating safely for decades with the exception of two major accidents, and the operators in Japan are following procedures to the letter and doing their best to maintain safety of the cores. The accident wasn’t a result of breakage from the earthquake, and had the tsunami not affected the diesel generators or offsite power so significantly, we wouldn’t be having this discussion. Nuclear power is very safe and much less polluting than other power generation methods. It’s also more efficient than other green methods like solar, wind, or hydroelectric, and doesn’t directly rely on the season. These reactors aren’t just slapped together and brought online. There’s a significant amount of engineering and planning for nearly every contingency and emergency, and people need to remember that. There’s another simple explanation by Kathy Gill at The Moderate Voice. There’s also a more-detailed explanation at Barry Brook’s blog. One of the best sources for non-spun up-to-date information on the emergency is the Nuclear Energy Institute. Please feel free to leave questions or comments below. Please send this to anyone who has questions or fears about this emergency event. Nuclear fuel bundle image sourced from Wikipedia via the United States Government and is used under public domain. Containment building image sourced from Wikipedia via the United States Government and is used under public domain. 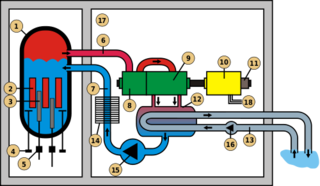 Boiling Water Reactor power generation schematic sourced from Wikipedia via Nicolas Lardot. The image is used under a Creative Commons Attribution-Share Alike 3.0 Unported license.